Pasquale's gutsy pick for last year's tournament finals. Will the brackets break their way again? Simmer the sauce! Toss the dough! And fire up the oven! The Tournament of Pizza, sponsored by Sunmark Federal Credit Union, is back! For the first time in the storied history of the TOP, the crowd helped picked the tournament field. More than 500 ballots were cast and eight pizzerias got spots in this year's tournament. As is tradition, the winners of last year's regional brackets automatically qualified for the field. That left four spots, one in each bracket, for the selection the committee to fill. Here's how the brackets shape up for the first round. There's a larger look at the brackets above (or just scroll up), and here's a pdf version for easy printing. The selection committee went to Clifton Park for the last spot in this bracket. Antipasto's is known for its vegetarian options, and that intrigued the committee. Pizza King and Fireside were a close 1,2 in the crowd voting. Rotterdam gets pulled into the party with the selection of Johnny C's. 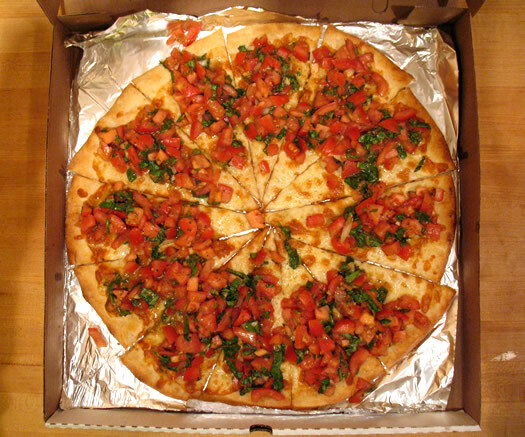 Watervliet's Giuseppe's was the #1 vote-getter in crowd voting. And Pop's, in Cohoes, is a newcomer. DeFazio's, upset in the first round of the inaugural TOP, takes the the final spot. The crowd went back to fan favorite The Fountain and the well-known Paesan's, both previous competitors (though Paesan's first appearance was via its Albany shop). This left the selection committee in a tough spot (it was hoping the crowd voting would mix things up a bit). Sensitive to Ed's passionate lobbying, the committee looked toward downtown. But it was also drawn to Lou-Bea's back-from-ashes story. And the Delaware Ave shop ended up with the final spot. TOP 2010 scoring will again feature the 100 point system. Results start next week. Big thanks to Sunmark Federal Credit Union for sponsoring another year of the TOP. So...is there a sit down judging? Or do the judges just order a pie anonymously and taste it on their own? Are spectators allowed? @Marie: And can we eat the leftovers? The Tournament of Pizza lasts longer than the NBA playoffs. Honestly, although I missed out on the voting, Townsend Park deserved a seat at the table this year. this is cute you all do this! I haven't had a Fireside pizza in years. I'm very interested to see if it's still as good as it used to be. Remember Ario's in Latham Circle Mall Food Court...??? Yeah yeah-I know it's still in existence on Rt. 7 but for whatever reasons-it's just not the same! Speaking (actually writing) of Latham Circle Mall-remember Papa Gino's! Sensitive to Ed's passionate lobbying, the committee looked toward downtown. But it was also drawn to Lou-Bea's back-from-ashes story. And the Delaware Ave shop ended up with the final spot. Haha, I'm a few days late reading this, but I appreciate the consideration and the mention. You raise a compelling point about Lou-Bea's (and that's the sort of cool result that curation can uncover that wouldn't have come out of a popular vote). The geography is indisputable: their stretch of Delaware Avenue *is* east of Lake Avenue, which is the first time ever for a City of Albany tournament pick! That totally counts for something. You should try Maris'a Place Pizza in Guilderland. It is first rate and authentic.